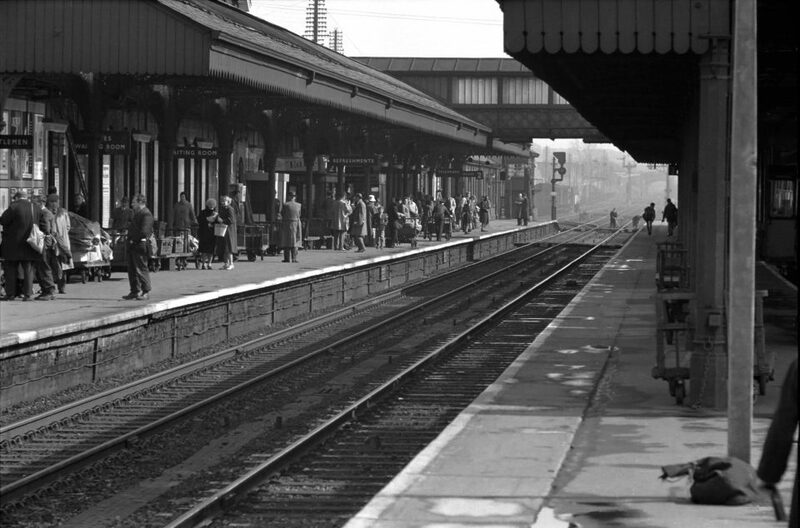 Grantham Station Buildings – a brief history. The current station was opened in 1852 by the Great Northern Railway (GNR) and consisted of one "Up" and one "Down" platform. Following this a "Western" platform was added for the "Ambergate" line connecting to the original Grantham station at Ambergate Wharf. The "new" GNR station had few buildings at this time. "UP" PLATFORM (Trains to London). The "Up" platform consisted of a central booking hall and office, with attached waiting rooms. The booking hall still remains, but the original waiting rooms were demolished during later extensions. These extensions covered refreshment rooms provided by modification to existing facilities northwards from the central booking hall. The "Up" platform also had a goods shed at the south end with small attached office. To the east of the goods shed was a granary erected soon after 1852. To the north of the "Up" platform a row of coal drops were located but these were removed following an unfortunate accident in 1854 involving two drunken cattle dealers. Alongside these coal drops stood a small ticket platform at which trains stopped before entering the station to allow inspectors to collect tickets. During 1852 - 1873 a further extension of the goods shed was considered, but only a limited expansion occurred. However, a new goods office was constructed to deal with the increasing amount of paperwork. Grantham at this time had become the headquarters of a district that included Nottingham, so in order to house the superintendent and his staff, the current brick buildings at the south end of the "Up" platform were constructed. The station master and other senior staff lived in houses on station road. Opposite the station entrance, on station road, stood the original water tower providing water for the "Up" platform water columns. A rather gruesome function of this water tower was the occasional storage of the bodies of railway employees (pending an inquest) who had been killed at work. "DOWN" PLATFORM (Trains to the North). On the "Down" platform the buildings originally consisted of a long shelter supported by wooden pillars with wooden braces to the beams. Central to this shelter was another wooden building housing a waiting room and ticket office for the Ambergate line. Additional buildings were also erected on the down platform, the most northern being a refreshment room. Others were used as waiting rooms and toilets. A distinctive feature of these buildings were the rounded tops to the windows and door arches. The wooden waiting room had a brick face added into the eastern side during erection of these later buildings. The wooden building actually survived until all of the down platform buildings were swept away during major modification work on the Down side platform. Fortunately our photographic survey took place well before demolition. LATER GENERAL CHANGES AND IMPROVEMENTS. Changes and improvements to the station buildings and facilities started in 1860 with even drinking fountains being added in 1862. The drinking fountains were mainly for use by the poorer classes who could not afford both tickets and refreshment room prices. The original footbridge was installed to avoid the increasing obvious danger to passengers crossing the main running lines to get to the down side platform. It was decided to position the footbridge as near to the up side booking office as possible. But on the down side this created a problem due to the close proximity of existing buildings. This resulted in a slight truncation to the stairs on that side. This footbridge was a feature of the station until it was completely rebuilt during major station modifications in the 1980's. The rest of the current "Up" platform buildings, evident today, were completed during 1878. These consisted of a range of new buildings erected at the north end of the "Up" platform for inspectors and 1st class passengers. The refreshment room on this side was built to cover the growth in requirements for this service. Dining facilities were also being provided by this time. Located south of the booking office were 3rd class waiting rooms and offices for the station master, the goods agent and a parcels office. A present day examination of these structures reveals a different architectural style to the original buildings. Many of the features described above can be seen in our first item A Photographic Survey of the Station Buildings.